A cold open on Mars is ill-judged, piling on expository details about a war between Martians that saps the energy out of the staged visualization of this conflict. The sudden cut back to Earth in the 1880s is jarring, and the way Stanton sets up the story, beginning with Burroughs’ stand-in learning of his uncle John’s death, only muddles the film further. By the time the movie goes into a flashback from Carter’s journal, I was nearly ready to check out. Then, it just kept getting better. The brief flashback of Carter, a Confederate vet turned prospector looking for enough gold to live his life outside anyone’s influence, introduces more easily followed character motives and actions. It is here that we get a first taste of the excellent editing, with Carter’s attempts to escape recruiting Union officers leading to a hilarious stop-start montage complete with music cues that never get to take off as the screen cuts instantly to each new recapture. Carter manages to find his sought-after cave of gold, only to come into contact with a materializing, humanoid alien who inadvertently sends the man to Mars. The sense of bubbly cheek that defined Carter’s escape attempts carries over to the red planet, as the Earthling discovers that the difference in gravity makes him strong enough to lift boulders and light enough to leap hundreds of feet in the air. 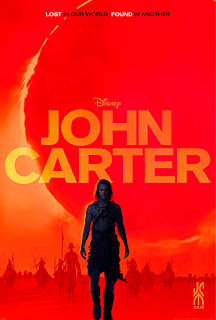 Though still bewildered at his whereabouts and so vicious that his first response to seeing aliens is to try to kill one, Carter’s joy at his newfound powers is infectious. In such moments, the burdensome narrative trivialities melt away into pure feeling, something so absent in silly adventure films these days. In fact, I had a better grasp of character with these figures from literature I’ve never read than I’ve gotten off some adaptations of well-known material. Kitsch, who at 30 years old looks so much younger that I almost didn’t buy him as a veteran even a few years after the Civil War’s end, doesn’t just stand around looking rugged. Sarcastic and weary, Kitsch plays around with the same sort of exasperated gallows humor that made Bruce Willis so memorable as John McClane. He finds just the right balance between an old-school hero, so ready for an adventure, and a more modern protagonist, tired of senseless fighting Mark Strong, playing a calculating villain who can literally steer others, gets to probe beyond Burroughs’ depictions of Therns (as I understand them), replacing a elitist Martian sect with a more apocalyptic parasite that conquers worlds by gently guiding its own inhabitants into self-annihilation. Strong’s bread-and-butter is the calm but menacing evildoer, but he’s rarely been so icily removed, even as his character has never enjoyed so much power. Best of all, though, is Lynn Collins as Dejah Thoris, a princess who moonlights both as a brilliant scientist and a fearsome warrior. All by her lonesome, she nearly replicates the highly advanced technology of the Therns before she is sabotaged, and when she is saved by Carter for the first time, she responds not with girlish eyelash-fluttering but with analytical curiosity of his mysterious powers. Dejah plays like Marion Ravenwood if that character hadn’t turned into a helpless wuss after the first act. To be sure, the princess still needs saving eventually, but Dejah embodies the film’s freewheeling, optimistic spirit. It is she who has the majority of the can-do dialogue, and as Carter slowly comes around to her cause, one gets the feeling that it is her conviction and passion more than her attractiveness that woos him. These characters overcome the thick narrative trappings that hamper them, and their universally understood desires and goals ground the action, which is spectacular. So much has been said (to my utter disgust) about the film’s budget, but to look at the action sequences, which are coherent and clearly planned to a tee, it doesn’t seem as if that money was just thrown around. As Brad Bird’s animation background made the stunts in the latest Mission: Impossible film at once ludicrously outsized yet fluid and understandable, so too does Stanton’s familiarity with micromanaged visual plotting suit him well. Carter’s massive leaps and the scale of the fights, which always seems to involve combatants numbered in the hundreds, never less, might have been pure havoc in the hands of a lesser director. Just imagine a shaky-cam, hurriedly edited presentation of Carter’s gravity-defying jumps, all whip-pans and jump cuts so that everything emerged a blurred frenzy. If Stanton received a great deal of cash to finance his film, at least he was nice enough to let the audience see what it bought. What further infuriates me of all this fetishizing of the film’s budget (apart from how it indulges the worst, most facile and sneering elements of “criticism”) is how people purporting to be film fans have practically delighted in ensuring that bold filmmaking and daring studio risks won’t happen again, as if they’d ever been that common. Stanton’s film may not be masterful, but it is visionary, and Disney trusted a filmmaker whose previous commercial success did not prevent him from being a big risk with a quarter of a billion dollars to launch a franchise of uncertain profitability. For some to latch onto its supposed cash problems recalls the cynical response to Michael Cimino’s Heaven’s Gate. The petty reporting on that film helped contribute to the end of an era of studio faith in talented directors; I wonder what message Disney has received for, in its own isolated way, trying to bring some of that trust and boldness back.